Since the advent of the Cold War, the possibility of a nuclear holocaust has profoundly influenced world events, and young people today have never known a life without the threat of near-instant, massive annihilation. Step back in time to 1983, when a joint U.S.-Soviet study group was formed to help prevent a nuclear war, particularly one caused by accident or miscalculation. Chaired by Graham Allison and Georgy Arbatov, the U.S. and Soviet teams’ mission was to draft protocols and procedures that could be followed in times of crisis. These were clearly defined mechanisms for leaders to adhere to in order to avert nuclear war. 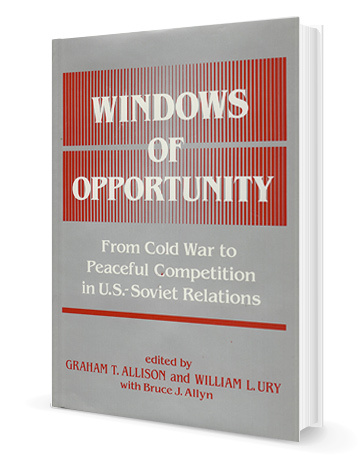 Windows of Opportunity, co-edited by William Ury (with Graham Allison and Bruce J. Allyn), is that extraordinary document. This book chronicles the evolution in thinking and best practices for nuclear weapons, nuclear accidents, arms control, European security, and competition in developing nations. View the table of contents or read a chapter from Windows of Opportunity. "This book comes at exactly the right time. Everyone concerned about the future of U.S.–Soviet relations should read this book."